Marcus Lim had always dreamt of becoming an athlete. However, throughout his childhood years, he could not seem to find a sport in which he was good at, which led to him being left out by friends who did play sports. Feeling extremely discouraged, he started avoiding all forms of sports until the moment he got to college where he met a group of Parkour enthusiasts experimenting with the sport. They would watch Parkour tutorial videos and try the moves out and for some reason, Marcus found that he was pretty good at it. He had finally found his sport. From then on, he decided that he would stick to this and haven’t regretted since. 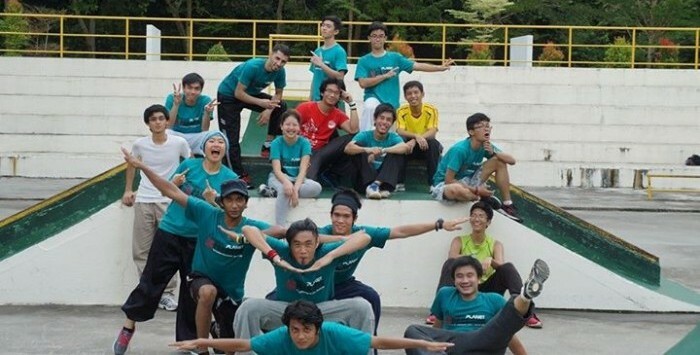 Marcus currently works full-time as a Youth Initiative Developer in Leaderonomics, but he still makes time to teach Parkour under Team Ascend Malaysia. 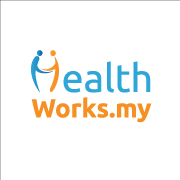 HealthWorks (HW): What are some of your biggest accomplishments that you have achieved from Parkour? Marcus: For me, Parkour was about building my body and mind. Therefore, I would say my biggest accomplishment is the confidence I have built over the years of practising it because Parkour requires practitioners to be in full control of their body, it builds a strong link between the body and mind. And exercising the body helps keep it fit too. So with better control of my body, and a fitter, better looking physique, it definitely boosted my confidence level. And to add on to that, this is finally a sport I never gave up on half-way. HW: What was the most difficult move that you had to learn when you first started or of all-time? Marcus: The most difficult move in Parkour, which until now some of us still struggle with, is the Forward Roll. The Forward Roll is meant to displace your momentum from a height drop that if any of our bones hits the floor, it would be disastrous. Most of the time people can roll, but the question is can a person roll on ANY SURFACE without hitting any bones on his back and shoulder. HW: Has your Parkour training helped in any real life situations? Marcus: Yes, twice. First was when my friend left his house key in the house so I climbed in through the window and unlocked the door for him. Second time was at a carpark, where a car came speeding out and luckily there was a wall to my right and I could get over it to safety. If I may add, my friend who was walking across the street also had a similar experience, where this time he jumped out of the car’s way into a dive roll. HW: How often do you train and how would an average training day be like for you? Marcus: I train up to 3 times a week. I will do 30 mins of warm up + conditioning, 2 hours of technical training and flow training. Technical training is practicing the moves in isolation while flow training is integrating 3 or more moves in one single run continuously. Then, end it with 30 mins of cooling down and stretching. HW: What is the biggest mistake that you have seen a lot of beginners and seasoned traceurs make? Marcus: The biggest mistake is using an obstacle before checking for its condition. Obstacles come in various forms and sizes, some slippery, some shaky, some hollow, some sharp. Before using any obstacles, one should always check before going at it. Arrogance and being over-confident is strictly prohibited in Parkour. HW: Have you gotten any major injuries throughout your training? How did it happen and what did you do for a speedy recovery? Marcus: My most severe injury would be dislocation of both arms multiple times. I was doing a move called a ‘catleap‘ and was overconfident about my body’s ability. My arms dislocated but we managed to pop it back in. Afterwards, I refused to discipline myself to allow it to heal and it dislocated around 20 or more times in the span of 5 months. It came to a point where even hanging on a bar might dislocate it so I decided to take a 6-month break with active recovery. Passive recovery is when you just stop exercising completely and let it heal. This is not advisable. Active recovery is where you do rehabilitation exercises such as slow rotation and lightweight training to strengthen the muscles around the injury, while doing low impact stuff to ensure that the injured site is not aggravated. After the 6-month recovery period, my arm was now stronger and it did not dislocate as much. My last occurrence was a good 1 year ago. HW: Is weight training important in parkour training? How do you incorporate it into your training? Marcus: Weight training can be important in Parkour, though we usually tell beginners to start with body weight training. Once you can lift your body and carry it well, you can move on to weight training to improve strength, power and endurance. 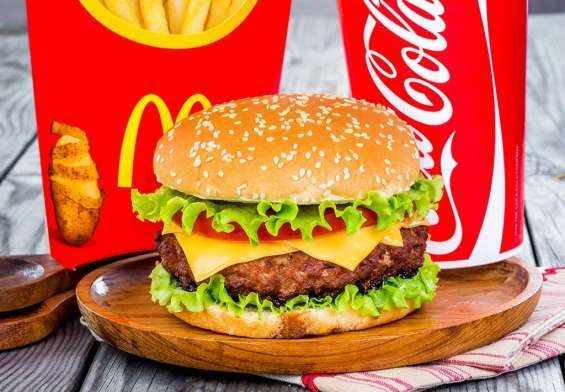 But always start with body weight. We usually do it in two ways. Adding it on our body as we run and Parkour. The more weight you carry as you run and Parkour, the lighter you get, and the smoother you can move from one point to another. You can also train muscles in isolation by using functional tools like Vipr, Sandbag and Kettlebells. HW: What are the basic moves of Parkour training that beginners will learn? Marcus: It is advisable to start off with Vaults and Precisions. That alone would take you about 3 months to master. Make sure to incorporate in into a continuous flow with other moves. Many people train the moves in isolation, individually. If you do that, you’re missing the point of Parkour. HW: Where do you like to go to practice your moves? Marcus: Playgrounds like Tasik Titiwangsa, Lake Garden, Taman Paramount, ExtremePark Shah Alam, Putrajaya Sunken Garden are nice places for Parkour. HW: Is there a local community for Parkour training? Marcus: Yes, it is called Parkour Malaysia. HW: Do you guys have any community events/competitions? Marcus: Yes, annual jams and free jams. 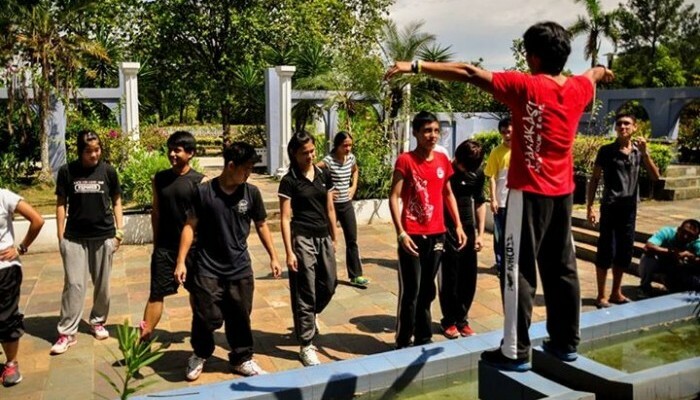 You can get updates on Parkour Malaysia. HW: Can anybody start Parkour training (including people who are unfit/short and more)? 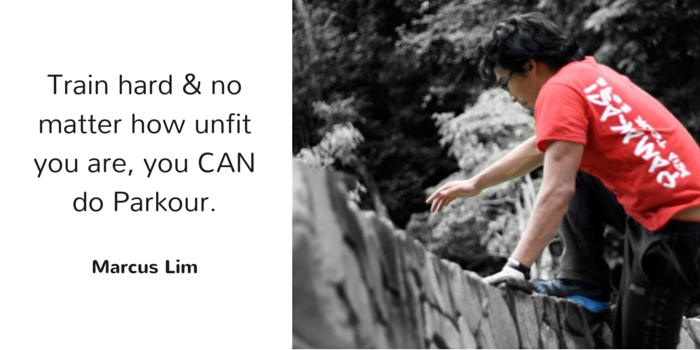 Marcus: The only barrier of entry to Parkour is your mind. If your mind says you can’t, then you can’t. If your mind says you can, then you can. Just start with the basics, and start with your current condition. Nothing materializes overnight, it takes years and years of training before getting to where those guys on YouTube are. Do not expect a miracle. HW: Any advice for those who want to learn this craft / beginners who are just starting out? Do not train alone. Seek out a group that is already doing Parkour and learn from them. If you do not have access to a group, find a group of friends who are equally as interested and learn it off YouTube, there are many tutorials there, just watch carefully. If there is no one else interested, train with people around. The last thing you want to end up with is an accident with no one there to help you or save you. Wear proper attire, not jeans. Train safe and always check your surroundings before charging it head on. Being a practitioner of Parkour for 7 Years, Marcus Lim is a certified ADAPT Coach by Parkour Generations and he coaches youth in the art of Parkour on a part-time basis under the banner of Team Ascend Malaysia. The group is currently holding weekly classes all around Petaling Jaya and coaches in Methodist College KL and Sunway University. On a full-time basis, Marcus is the Youth Initiative Developer in Leaderonomics, specializing in Leadership Development in schools running programmes such as the Leaderonomics Club and Leaderonomics Prefects Programme. He enjoys playing the guitar when he’s not leaping onto walls.